In this interview, Peter Banks discusses the advantages of quantitative microscopy, and provides advice on selecting a microscope for this application. Why has microscopy historically been a qualitative technique and how have advances in technology enabled microscopy to be quantitative? Microscopy's got a long history. It was developed about 350 years ago for scientists to visualize things they could discern, but not describe. The two pioneers of microscopy were Antoine van Leeuwenhoek, who developed the first microscope and soon after the renowned scientist, Robert Hooke. Their microscopes magnified specimens by 10-20 times which allowed them to visualize details of known specimens like lice up close for the first time, but the remarkable discovery was a microscopic world that they didn't know was there. Van Leeuwenhoek coined the term animalcules, which represents what we would call bacteria and other protozoa in water that science knew nothing about. With these early microscopes, they were able to visualize them for the first time. Over the balance of the 350 year history of microscopy, it's been a qualitative technique. Researchers and scientists wanted to visualize microscopic specimens and report what they see. Quantitative microscopy is quite a bit different. It has been enabled by the digital age, and specifically by the ability to digitize light through the use of transducers like charged coupled devices, or CCD cameras, which are present in almost every digital camera these days. These cameras allow image capture in a digital format which can then be processed and analyzed using computer programs to quantify the biology in your image. How can quantitative microscopy be used to assess intracellular environments? There's a host of ways to do quantitative microscopy. A very common way of doing a quantitative experiment through microscopy is using various fluorescent probes. Typically this starts with the use of a nuclear stain. These are chemical stains with a selectivity for DNA. Almost all of your cells’ DNA is located in the nucleus, so this chemical stain will preferentially stain the nucleus, allowing the nuclei in your image to be identified. With the assumption that one cell has one nucleus, this first stain allows cells in your image to be identified and counted. 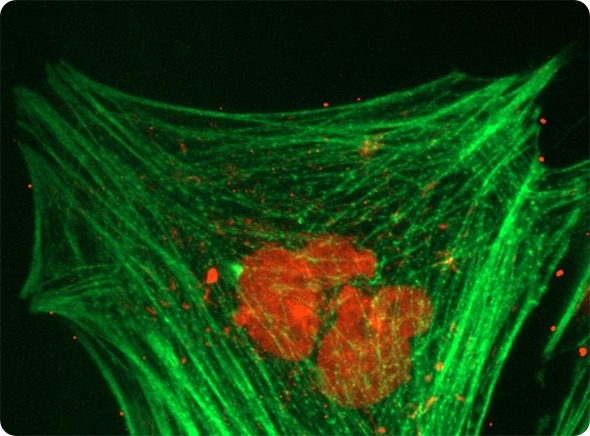 Then other fluorescent probes of different colors can be used to look at either cell structures and/or quantify cellular function. There's a wide variety of commercially available fluorescent probes. As examples, we can use different fluorescent probes to quantify mitochondrial membrane potential, the production of reactive oxygen species, or protein translocation events. This latter application uses caspase-3, which is activated by apoptosis to translocate from the cytoplasm to the nucleus. We have also used microscopy to quantify RNA cancer biomarker transcription through the use of fluorescent in-situ hybridization. There's so many possibilities for quantitative microscopy because there's a myriad of different probes available. What advantages does quantitative microscopy allow over traditional microscopes? Quantitative microscopy enables cellular biology by providing direct, real time quantitative measurement of cell processes through both image processing and analysis. If one considers a traditional microscope being a device with only qualitative capabilities (no image processing or analysis), then remarkable images can be acquired detailing cellular structure, but cellular function measurement is at best semi-quantitative. Digital imaging and computer power combine to provide quantitative microscopy. An example of the utility of quantitative microscopy is in drug discovery using a cellular model expressing a phenotype that simulates a particular disease. This phenotype could be as simple as a cancer cell line’s ability to proliferate. Effective drugs would reduce or stop the proliferation of these cells. This phenotype can be quantified by counting the cells in real time using microscopy. This will provide information concerning which drugs are active against the phenotype, rank their ability to suppress the phenotype, determine the kinetics of active drugs and quantify the pharmacology of the most promising drugs. Are fluorescent tags or dyes a necessity for quantitative microscopy? Fluorescent probes are very useful for quantitative microscopy and many have been developed for both fixed and live cell assays. Label-free methods can also be used for quantitative microscopy and this is particularly beneficial for live cell imaging. BioTek has a number of methods for performing label-free quantitative microscopy, without the use of fluorescent probes. The brightfield channel, which monitors a specimen’s ability to absorb white light is one form of label-free microscopy. We have used this form of microscopy to measure the % confluence of cells in a microplate well and in tumor invasion assays. 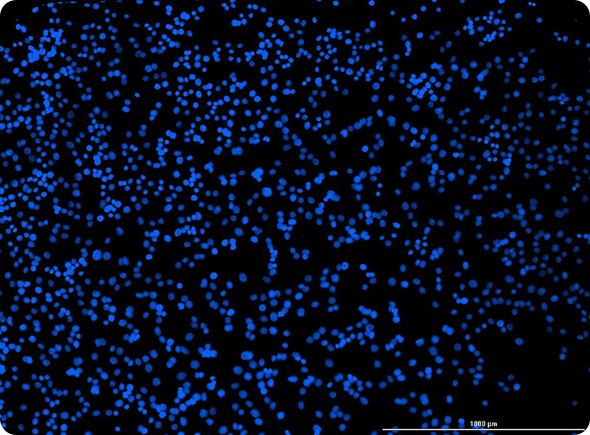 BioTek also has a proprietary method for enhancing the contrast of our brightfield channel which allows label-free cell counting for applications like cell proliferation, for example. In addition, some of our instruments possess a phase contrast channel of microscopy, which utilises refraction of light through the sample for contrast enhancement. This has been used for quantifying apoptosis through measuring the roundness of cells. What microscopes do BioTek supply for quantitative microscopy? BioTek microscopes provide automated digital widefield microscopy. By automated, I mean image capture, processing and analysis can all be performed by the instrument with preset parameters input by the operator. Our microscopes involve one type of geometry, which uses an inverted, epifluorescent design. The modes of microscopy available include fluorescence, brightfield, high contrast brightfield, color brightfield and phase contrast. How do Cytation 3, Cytation 5 and Lionheart FX differ? What type of researcher is each microscope designed for? The development of these instruments was originally based on our knowledge of our markets at the time. We've been a microplate instrumentation company for over 30 years so the first product we had in microscopy was based on the design of one of our most popular microplate readers into which we added the inverted, epifluorescence designed microscope. Thus our customers could perform all their typical microplate reader applications, like ELISAs, protein, DNA and reporter gene assays, but now also do brightfield and fluorescence widefield microscopy. This first product was the Cytation 3 which was launched in April 2013. Over the next three years, we expanded the number of microscopy modes available to include high contrast brightfield and in the Cytation 5 , color brightfield and phase contrast. Over this period, we also significantly enhanced our abilities in quantitative microscopy by continuously developing new image processing and analysis tools. Lionheart FX is our newest product and somewhat different from the Cytation products in that there is no traditional microplate reader optics in the instrument, it’s been designed for the microscopist who wants to do live cell imaging. Fixed cell imaging can still be performed, but all the environmental and humidity control aspects of that instrument have been designed to enable long-term kinetic experiments using microscopy. Furthermore, exquisite high-resolution microscopy can be performed on Lionheart with both 60x and 100x oil immersion microscope objectives. Can all of your quantitative microscopes be used for live cell imaging? Or just the Lionheart FX? All three can be used for live cell imaging. 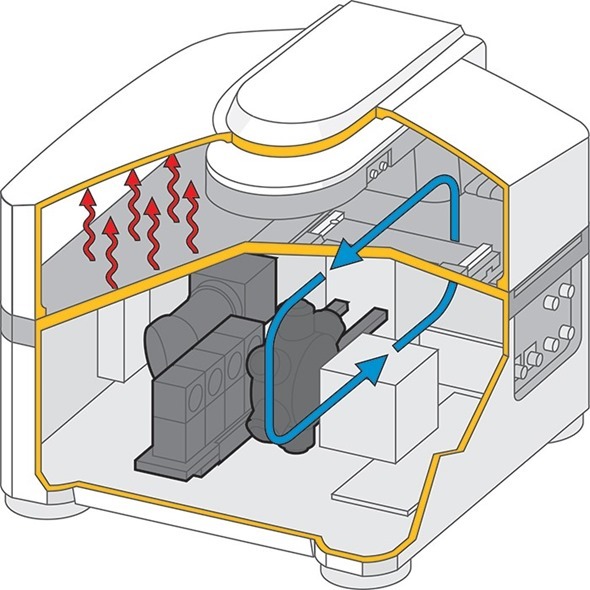 The Cytation 3 and 5 have an accessory gas controller which maintains CO2 and O2 levels directly in the detection chamber of the instrument, which is also temperature controlled. This is useful for shorter term kinetic experiments using live cells. There's no humidity control in the Cytation 3 or Cytation 5 so for long-term kinetic experiments we recommend the use of our BioSpa 8 automated CO2 incubator that holds at least eight (8) pieces of labware. The BioSpa delivers microplates or other labware to the Cytation 3 or 5 and returns them to the incubator once a reading is done via a robotic arm. In addition, the BioSpa 8 also monitors the environmental conditions and records the data. This marriage of instruments is part of our BioSpa System for long term kinetic assays with live cells. The Lionheart FX is a self-contained instrument that controls the temperature, CO2 and O2 levels, and humidity directly. The Lionheart is more for the traditional microscopist who at most wants to do one plate at a time. What type of cellular events can be observed in this way? Real time cellular events in live cells can be sorted by the length of the kinetic experiments being conducted. Long-term kinetic experiments investigate cells over a period of days to a week or two. For example cell proliferation studies used in oncology research, typically require up to a week to complete. Variations on cell proliferation would be cytotoxicity research, where drugs are added to try and inhibit cell proliferation. Scratch or wound healing assays are also common applications. These studies can last from around a day to several days depending on the migration capabilities of the particular cells you're interested in. Tumor invasion assays also may require several days to complete. In these assays, cells aggregated into a spheroid and surrounded by matrigel mimic the in-vivo condition of a tumor in surrounding tissue. The rate that the spheroid cells invade into a surrounding biological medium is quantified. Conversely, short term live cell kinetic experiments last minutes rather than days. These assays investigate rapid cellular function. For example, calcium imaging measures the real time flux of calcium ion induced by receptor activation. This flux rises and falls typically over a period of about a minute. With imaging, we can determine how individual cells respond differently to receptor activation. This is evident in both the magnitude and the kinetics of Ca2+ production. We've also measured the kinetics of second messengers in GPCR signalling, a highly druggable gene family. GPCRs account for around 60% of all known drugs, making them highly studied by pharmaceutical companies. These second messengers also have fast kinetics that are typically spent in the minute range. These assays used genetically encoded fluorescent protein technology that have either increased or decreased fluorescence based on the presence of these second messengers. This also allows you to multiplex the detection of these second messengers: for example, we've multiplexed a cAMP with a diacylglycerol biosensor. That's a really nice quantitative biological application. So with all our instruments, we can do both short-term and long-term kinetic experiments on live cells. 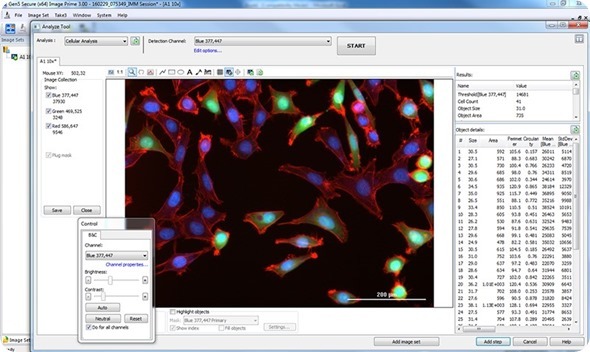 Do you provide image processing software that can be used with your microscopes? I want to start by making a difference between imaging processing and imaging analysis. To my mind, imaging processing involves background reduction, smoothing, stitching a montage of images together or taking a Z-stack and projection through thick biology. Conversely, image analysis uses various algorithms to quantify biology after acquiring and processing that image. We have two different levels of image analysis software to meet specific analysis requirements. 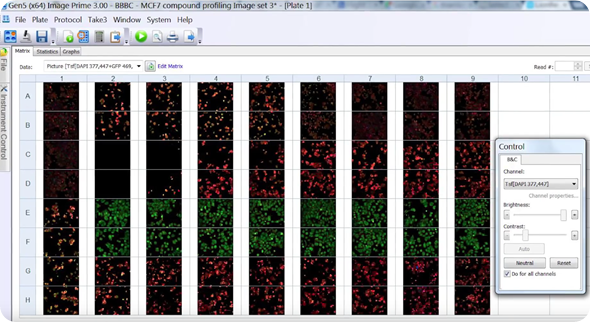 Gen5 Image+ allows you to perform simpler applications like counting cells, measuring transfection efficiency of GFP, for example or determining % confluence. Gen5 Image Prime, contains a much more sophisticated package of image analysis tools that really enables quantitative applications in microscopy. These applications include nuclear translocation, fluorescent in-situ hybridization, co-localization studies, and cell cycle analysis, among others. Where do you see the direction of quantitative microscopy moving in the future? Both in terms of improvement in the imaging software and in microscopy automation? I think BioTek is now established as a leader in automated quantitative microscopy. We will continue to further this reputation as we build out our capabilities in simplifying microscopy through automation and enhancing the phenotypic assay capabilities that Image Prime enables. One area where I think automated quantitative microscopy can be extremely beneficial is applied to 3D cell culture methods. Scientists are moving away from imaging a layer of 2D plated cells, whether on a microscope slide or microplate well. Extensive research is being performed with structures like hydrogels, spheroids, tissues and organ on chip devices. I think automated quantitative microscopy can better enable these physiologically relevant types of assays, where the experiment sample more closely resembles what's going on in human beings. Where can our readers find out more about BioTek and your quantitative microscopes? Peter Banks is the Scientific Director at BioTek Instruments, Inc. His responsibilities include the management of the company’s applications team and providing scientific guidance to the senior management team on new technology and emerging trends impacting the microplate market and its peripheral markets of liquid handling and detection. Before joining BioTek in 2008, Banks was employed in a number of roles within PerkinElmer for a decade. These roles included management of PerkinElmer’s BioPharma R&D program and Director of Molecular Pharmacology for PerkinElmer BioSignal in Montreal, Canada, focusing on the development of numerous detection technologies and reagent systems for High Throughput Screening. 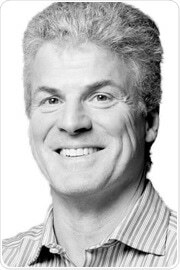 Prior to experiences at PerkinElmer and BioTek, Banks was an Assistant Professor in Analytical Chemistry at Concordia University, Montreal, Canada from 1994 to 1998. Banks was awarded an NSERC post-doctoral fellowship in 1993 following his dissertation for PhD at the University of British Columbia in 1992. The two pioneers of microscopy were Antoine van Leeuwenhoek, who developed the first microscope and soon after the renowned scientist, Robert Hooke. Van Leeuwenhoek coined the term animalcules, which represents what we would call bacteria and other protozoa in water that science knew nothing about. Both double-lens and single-lens microscopes were developed before Hooke began using the double, which magnified around 20 times, in the early 1660’s and Leeuwenhoek began using the single, which magnified up to 268 times, later in that decade. Galileo and others were the pioneers who preceded Hooke and Leeuwenhoek by several decades. “Animalcules” was used in English long before Leeuwenhoek, who in any case wrote only in Dutch. He called them “dierkens”, little animals. Henry Oldenburg translated “dierkens” as “animalcules” for Philosophical Transactions and poor Leeuwenhoek has been saddled with it ever since.